I don’t consider myself an abstract artist, and I’m not even sure this is considered abstract art, but I really enjoyed making it. 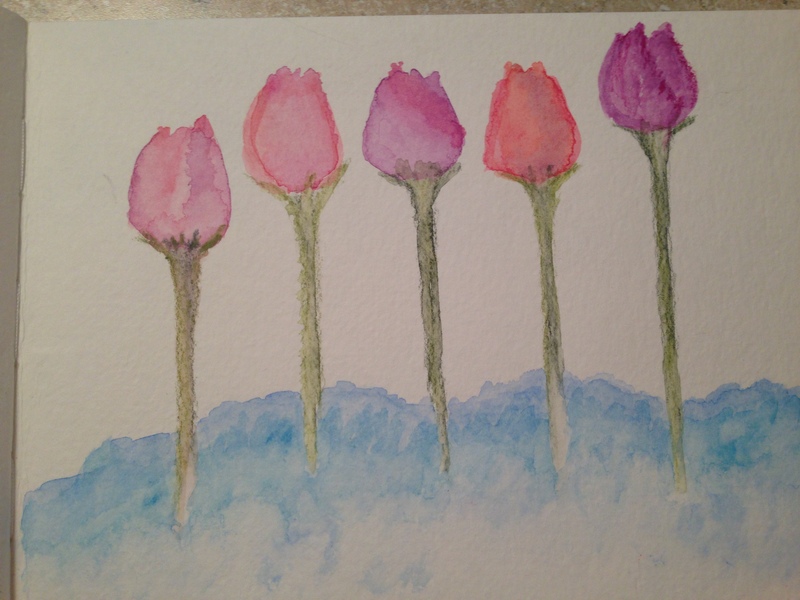 I love watercolor, but I’m finding the learning curve pretty steep. In fact, watercolor is what drove me to drawing, because I found that it took longer to do the underdrawing for a flower than it did to paint it. This was done with watercolor pencils. I got a set of Derwent watercolor pencils for my anniversary last year (it was the only thing I wanted). I fell in love with them right away, because they allowed me to have the control of a pencil with some of the feeling and effect of watercolor paint. Now that I think about it, it would be cool to pick a few colors at random, take them and a watercolor sketchbook to a coffee shop, and just see what comes out. I’d have never come up with this painting otherwise, and I like the clouds better than a flowerpot or a vase….or maybe it’s just my weird sense of what’s pretty. I do too! Thanks. I intend to become a watercolorist. That’s what my drawing journey is all about. Onward! Happy Friday. Thanks, T, I’m glad you like it! Wise choice: grow the flowers in the cloud.Nice! Thank you! I wasn’t sure if anyone other than I would like this! Starting the alphabet over again? Go watercolors! I love them and hate them but I love them. There is nothing like them… But mostly just love them on your journey ….I do believe they respond to love. I’m looking forward to watching them bloom here. Marika, that was such a sweet comment. Seriously, you should think about writing poetry! 😀 My busy season at my “real job” is now and the next couple of months, so I probably won’t be able to post much watercolor work at all (in fact, this one was done in early December), but I will try and maybe squeeze something in on weekends, even if it’s just watercolor pencil stuff. I do love it. I agree with you that there’s nothing else like it.